Whenever we pick up our cameras to photograph a wedding in the Washington, DC metropolitan area, we strive to use the images we create to tell that particular couple’s love story. We want the gallery of photographs that we deliver to the newlyweds to not only chronicle what happened on the day they got married, but also to show the world what makes their relationship unique and what it was that brought them together and to the altar. A picture of two people communicating their love for one another through a glance, a caress or even through their body language can literally say more about their feelings than an entire book of words. To make sure that we continue to approach the work of photographing marriage celebrations in and around Washington, DC, from this perspective, we will sometimes challenge ourselves to try to retroactively tell the story of a particular wedding day in as few images as possible. We go back through a gallery of photos that we have already delivered to our clients and try to select 15 or fewer shots that can narrate the entire event by themselves. This ensures that at future weddings, we always stay focused on getting on film not just the most obviously significant moments in a wedding, but also the little ways in which brides and grooms communicate their love for one another. One of the things that we have noticed when have done this exercise is what a unique challenge the getting-ready portion of a wedding day poses. From the time a bride sits down to have her makeup done to the moment when the future spouses have their first look (if they choose to) or the moment when the groom enters the ceremony venue, there are (conservatively) hundreds of little scenes that matter. The bride seeing her hair and makeup in the mirror for the first time. The mother of the bride seeing her little girl looking so beautiful and ready to marry the love of her life. The bridesmaids sharing a teary hug with their sister/cousin/friend. The bride-to-be getting helped into her wedding dress. These are just a few of the moments that could be vital to narrating the love story of the two people getting married. While it is great to have so many great options, it is sometimes a little hard to whittle down to the one or two images that perfectly encapsulate that portion of the day! 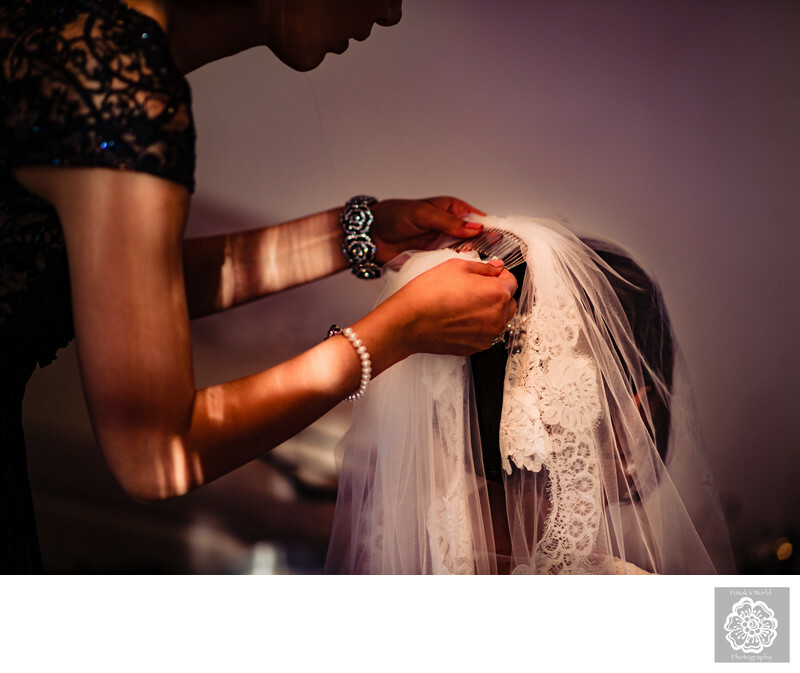 The picture that we felt best summed up the process of getting this bride ready for her outdoor ceremony at Rust Manor House in Leesburg, Virginia, was a very simple one. She was already completely made up and zipped into her wedding dress, and was just attending to the final touches before walking out the door. One of her bridesmaids (who was also her future sister-in-law) brought the bride her exquisite veil and helped fasten it to her hair. The reason this image was so significant in telling the story of this bride’s wedding day was because the gentleness with which her future sister-in-law attached the veil spoke volumes about how close-knit this family was, how being there for one another was a huge part of the family’s shared ethos and how a marriage simply increased the size and reach of all that. Location: Rust Manor House, 802 Childrens Center Rd SW, Leesburg, VA 20175.